How important was the role of the princes in bringing about the success of the Lutheran Reformation in Germany in the years 1525 to 1555? How important was the role of the princes in bringing about the success of the Lutheran Reformation in Germany in the years 1525 to 1555? The princes played a very important role in bringing about the success of the Reformation with certain princes making a larger impact than others. Philip of Hesse, John and Maurice of Saxony and all that were part of the creation of the League of Schmalkalden all helped the Reformation's success. However Elector Frederick the Wise dies early in 1525 and his contributions with helping Luther's volatile situation after the Diet of Worms and beyond cannot be counted. The actual princes themselves were anyone with sovereign powers so could have been a number of people in power including emperors, one of the electors or even rich noblemen. Also the fact that some princes did very little to prevent the spread and success of Lutheranism was important as this could have hindered their chances significantly. 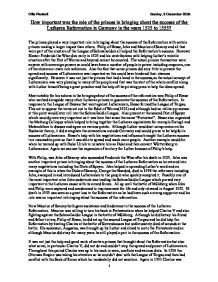 However it was not just the princes that had a hand in the success, as the actual concept of Lutheranism was very pleasing to many of the people and that was the start of the whole conflict along with Luther himself being a great preacher and the help of the printing press to help the ideas spread. Most notable for his actions in the bringing about of the success of the reformation was Philip of Hesse who worked alongside many other Lutheran princes to guarantee the success of the Reformation. ...read more. Maurice was willing to turn his back to Protestantism when he helped Charles V and also fighting against the Schmalkaldic League in the battle of M�hlberg. Although he did betray his friend and father-in-law, Philip of Hesse, he did set up the second League of Torgau and he did help the Reformation by beating Charles at the battle of Sievershausen but unfortunately died of wounds at the battle. His successor, Augustus, was brought up by Luther and aimed to unite the Protestants and so although Maurice did stray for many years he still played a part in the success of the Reformation. It was not just the help and good work of certain princes that brought about the Reformation but also what some, in particular Charles V, did not do and couldn't stop the spread and power of Lutheranism. Throughout this period Charles was up to his neck in wars, conflicts and various diets. In 1526 the Ottoman Empire was taking his attention so he couldn't deal with the League of Torgau and then had conflict with the Sack of Rome which he incidentally did not sanction. Again in 1531 Charles was weakened by wars with the Turks and desperately needed money so could not address the situation with the founding of the Schmalkaldic League for example. All of the way though the years Charles was preoccupied with secular matters and his relationship with the pope was was beginning to wear thin. ...read more. 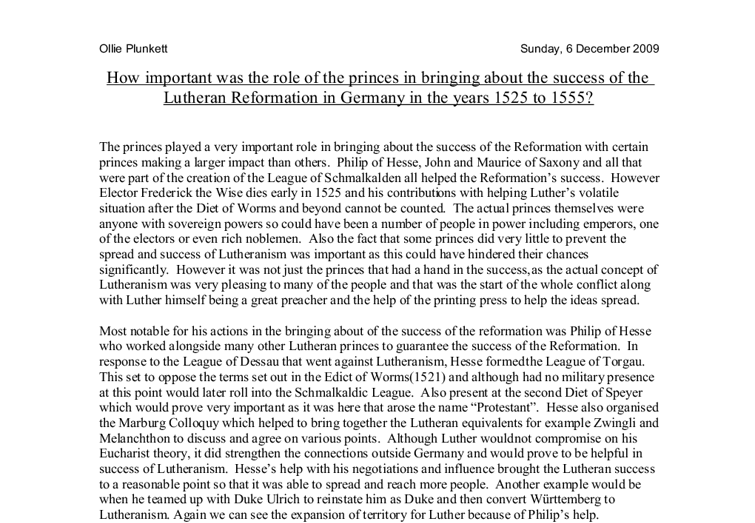 In conclusion, the role of the princes in bringing about the success of the Reformation was very important as they were the ones that went to the Diet of Speyer when Luther had been banished. They were the ones that fought in the battles to defend the right for people to believe in Lutheranism. And they were the ones who built up the Lutheran lands and converted 51 of 65 imperial cities and helped to cause 7 out of 10 inhabitants in Roman homes to admit to believing in Luther's work. However Charles with his concentration elsewhere at pivotal points in Lutheran history , always wanting to compromise will always been seen as a failure in Catholic prevention of the spread and success of Lutheran Reformation but as a godsend for the Lutherans. Luther himself proved important even after he set his ball rolling and reform was in full swing by keeping moral up and writing his guides on lutheranism and generally keeping the power of the Reformation going. Also it goes without saying that the printing press was also very important in the publishing of Luther's books in this time period but also at the start of the spread of Lutheranism. So although Luther started the Reformation back in 1517 with his "The Ninety-Five Theses" it was the help of the princes that proved the most important in the success of the Reformation between 1525 and 1555. Ollie Plunkett Sunday, 6 December 2009 Ollie Plunkett Sunday, 6 December 2009 1 1 ...read more. It permitted various industrial and agricultural branches to conduct foreign trade by themselves, rather than having to operate indirectly through the bureaucracy of trade ministry organisations. In addition, regional and local organisations and individual state enterprises were allowed to conduct foreign trade. due to the vast numbers in Xerxes force, it seems if it wasn't for the traitor Ephialtes, the Greeks could have continued to hold the pass. Leonidas was carrying out the strategies devised by Themistocles at the meetings of the Hellenic League before the battle at Marathon. In this respect, it can be said that the division was not fault of the USSR that the USSR was just acting in defence; therefore it cannot be put to blame. However, I don't believe this, as the Soviets instigated the Prague Coup, which stated that the West was indeed threatened by Soviet Aggression. in 1976 Tutu writes a letter to Prime Minister B.J Vorster to warn him about rising black anger over aprtheid(Steven Gish 13). having traveled and seen countries strive and fight until their freedom, he warns him that it is bound to happen. Italy had a number of industries, Textile, Wool, Silk and cotton. The Cotton industry was the main industry at the time employing around 114000 workers in Piedmont. There where a number of reasons for the lack of industrialisation in the peninsula. To what extent could the Crusades be described as failure within the years 1095-1195? The reasons for such success are different. Firstly, Crusader leaders were well motivated both religiously and personally. Believing that God is ?on their side? they put maximum efforts in achieving their goals. Also personal goals such as, perhaps, increasing wealth could push some to work and fight harder on their way.